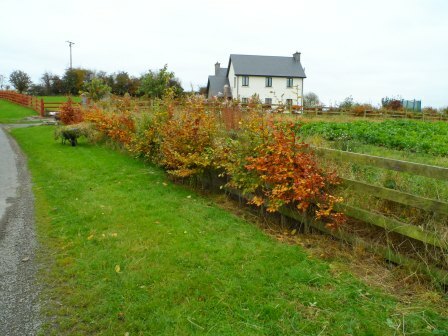 The most photographed beech hedges in Ireland! 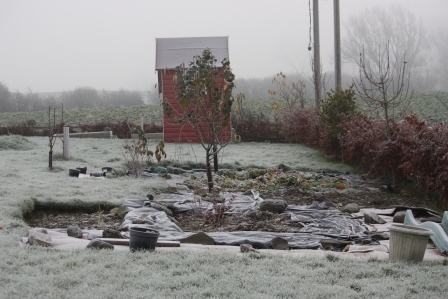 Vegetable garden in November. 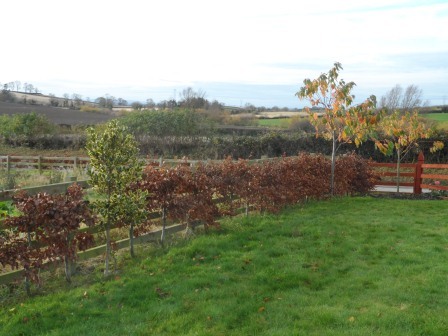 The beech hedges are finally finished! Tenacious. This word played around in my head as I enjoyed another day of working in the garden. You’ll never guess what I was doing… more weeding and trimming along the hedge! Tenacious, or maybe crazy? No, I like tenacious better than crazy. Determined is another word that comes to mind. It just once again shows me that anything is possible if you put your mind to it, stick to it, and take it in small steps! You know, maybe it does help to be just a little bit crazy, too. I have been very unlucky with nettles the past few times in the garden. My hands, my legs, my feet, my ear (!) have all been stung numerous times. I wish I could say I’m getting used to it, but it still hurts every time. Some of the nettles were as tall as me. You could say that the weeds had gotten a bit out of hand! The very good news is that I have finished the worst of the job. I worked on the area around our vegetable beds, and it looks better than it ever has. I am so pleased with it. I really didn’t like taking pictures of that area since the weeds were higher than my hedges. Granted, a lot of the weeds were on the farmer’s side of the fence, but still. A cleaned up vegetable garden. Speaking of the farmer, he was out harvesting his sugar beet in the field behind our house yesterday. He’ll use the sugar beet to feed his cattle. I enjoyed a nice chat with him. He offered to spray those weeds on his side of the fence for me. He said he hadn’t done that since he knew I didn’t like sprays. (He’s getting to know me!) He’ll be moving cattle into the field next week. Do cows eat nettles??? Field in foreground is harvested sugar beet. An Irish Robin under the fence. I was lucky enough to catch a picture of this little Robin while I was working. It’s worth keeping the camera at hand! 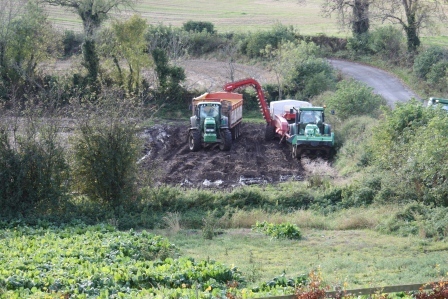 The picture of the harvested sugar beet above, was taken at around 1 PM. I thought the sky was so pretty, even though still somewhat gray. I think this is my first post with no pictures of flowers in it, but I’ll finish with a picture I took of the moon. It was quite low, and you can just make out the trees (if you look *real* closely) and the cloud behind the moon. It was spectacular to see! 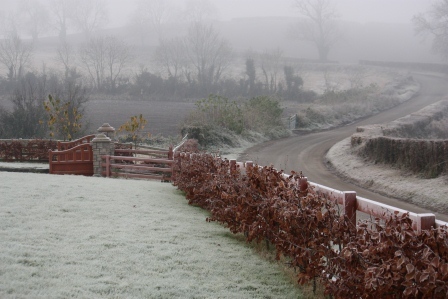 A frosty end to November. 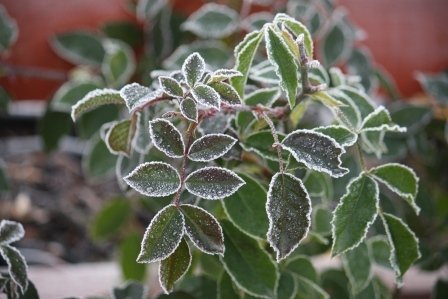 We had our first hard frost the other day. Winter is here! I won’t complain, as it really hasn’t been cold, and even today it isn’t too cold (today it is 6 degrees C/ 42 degrees F). 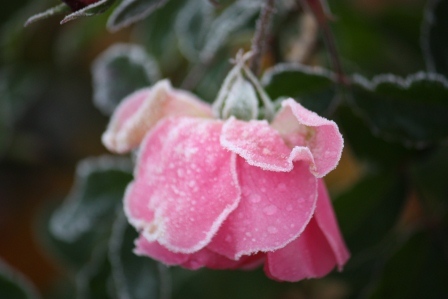 I was able to capture some of the flowers in the garden on the frosty morning. I love how they look covered in crystals! 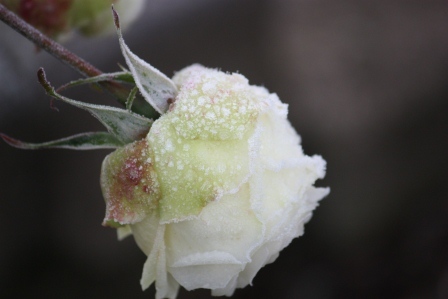 A frosty Silver Anniversary Hybrid Tea rose. 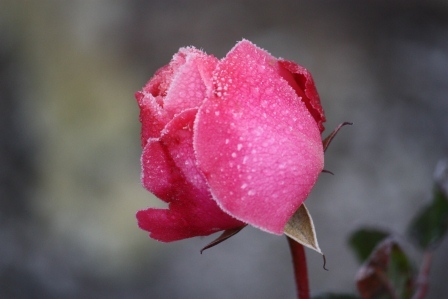 A frosty Pink Peace Hybrid Tea Rose. Even the greens of the rose plant look pretty to me! I have some London Pride plants almost hidden in a very small garden. I want to bring them out to a more showy place next year. They have a lovely tiny, delicate pink flower when in bloom. Their greens are quite nice, now, too. Our grass is quite long! 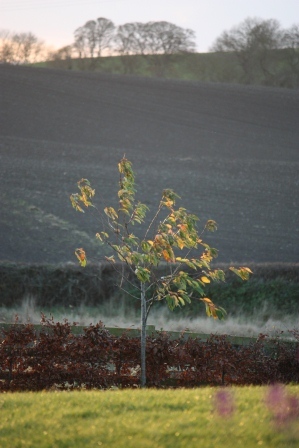 It was just too wet at the end of the season to give it that last needed cutting… Should be interesting in the spring. Yes, I even took a picture of the too long grass. 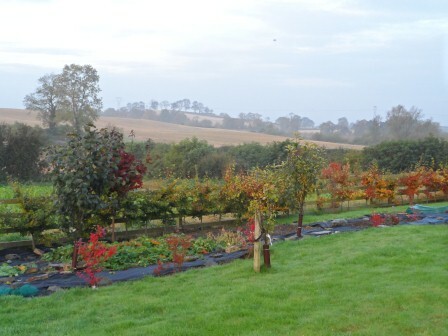 End of November view of the Fruit Orchard. 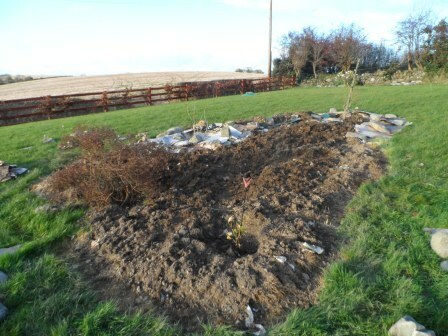 The fruit garden is being expanded. So I have newspapers and cardboard down to kill the grass. I am using large flower pots filled with stones to hold down the cardboard, oh, and an unused slide! I am not too impressed with how this looks, but thankfully, it is only for a short time! 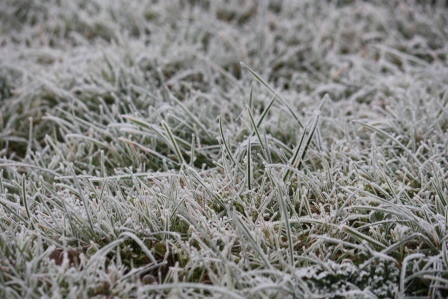 Frosty November morning. Garden bed in the making. 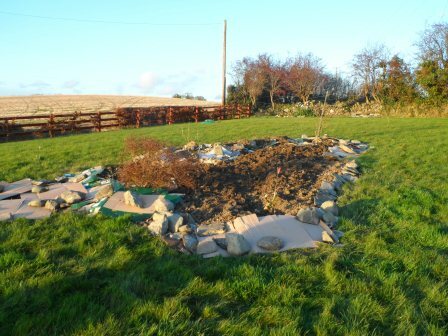 This garden bed in the making looks like a triangle, doesn’t it? I am planning on making it into three circles, but I have a good bit to go still! On the far side of it, I have quite a large rock. I have yet to figure out how to incorporate that into my garden. For now, it is just “there” and my kids enjoy climbing on top of it. 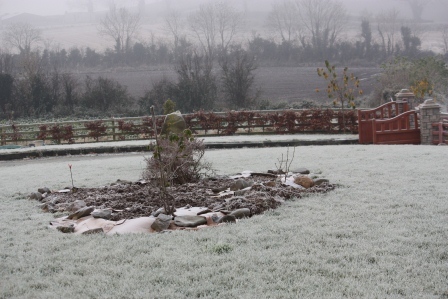 A frosty view of our front yard. It looks like snow, doesn’t it? I’m glad I trimmed the hedges for all of these photos. 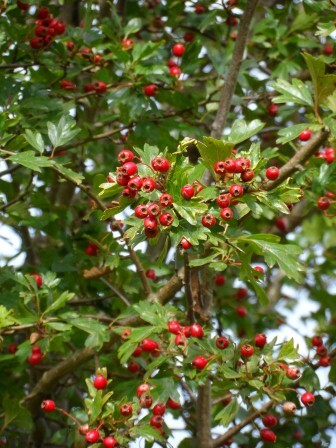 The Hawthorne trees which have been freed from ivy are doing so well! 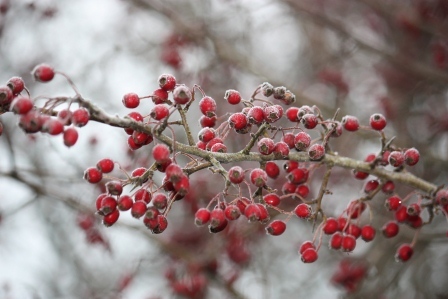 I love seeing all of the berries! 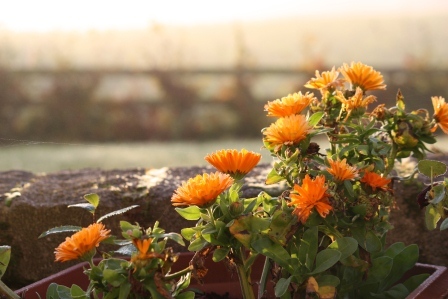 I will definitely be planting Calendula again next year. 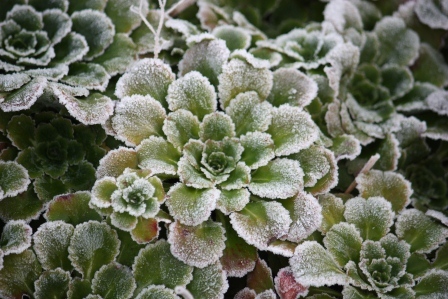 What a hardy, pretty flower! As for hardy vegetables, I am told that parsnips taste better after a frost. 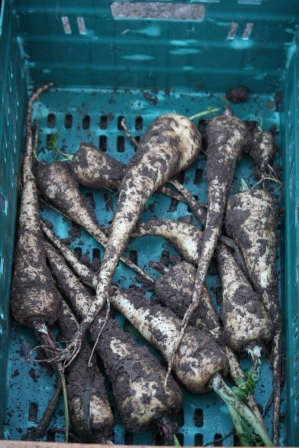 We dug up a bunch of ours for Parsnip & Maple Syrup soup for our Thanksgiving celebration. I was very pleased with the size, shape, and taste of the parsnips! 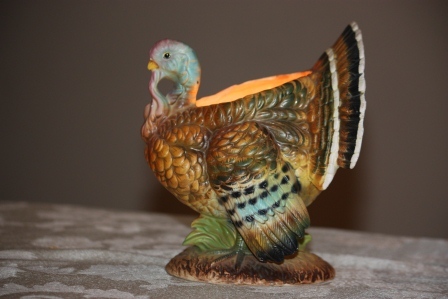 For me, November is for giving thanks. This past weekend we enjoyed a beautiful Thanksgiving feast with some lovely American friends of ours (and Polish, too!). It is a perfect way to finish up the month… before diving into the Christmas season! 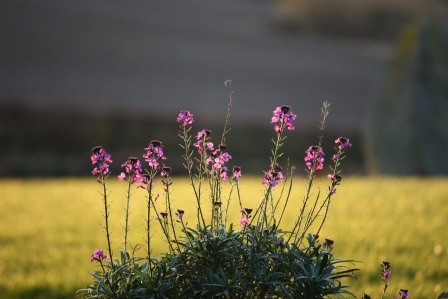 Erysimum Bowles’ Mauve – My flower of the Moment. 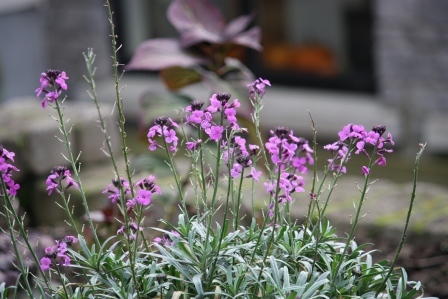 Erysimum Bowles’ Mauve late on a November day. 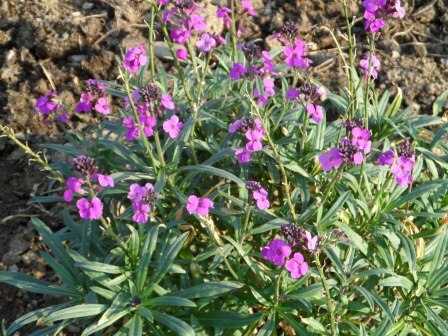 I had to write about this plant, Erysimum Bowles’ Mauve, as it has been flowering all summer. Even now in November it is still showing off. Apparently, it likes to do that! 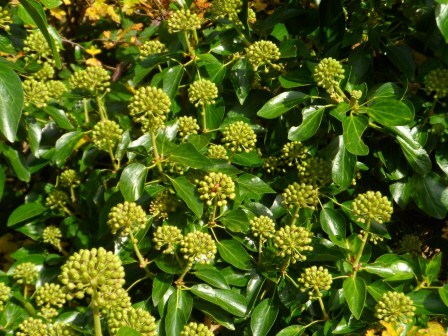 It is an evergreen perennial. I think that it just brings a lovely bit of color to the garden. I’d have a hard time picking a favorite flower, but this one is really up at the top. I was in the yard today with my littlest one. 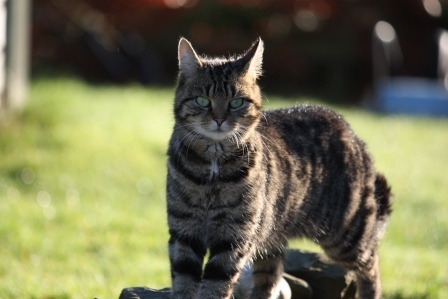 She was in such a happy and playful mood, just wanting to be with me in the garden. I had to capture that! 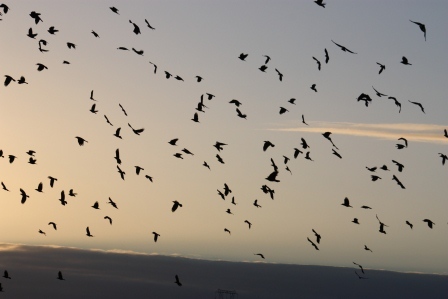 While we were outside (taking pictures of the Erysimum), a flock of birds flew overhead. With camera in hand, I snapped away. 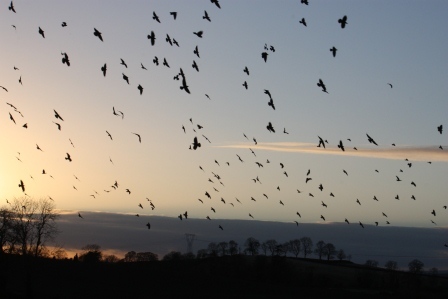 Just a few of the flock that were flying overhead! 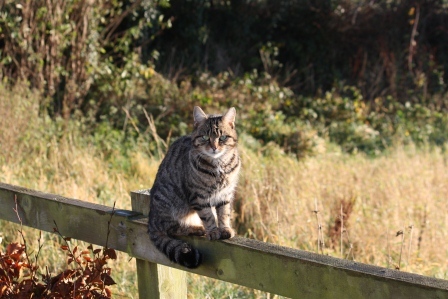 Lucy waiting with me … for birds! 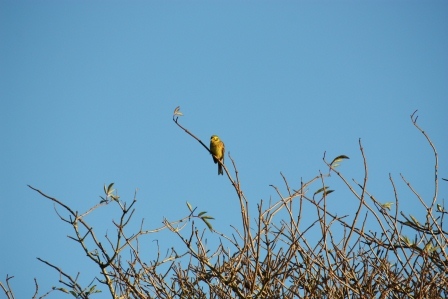 Yellowhammer bird, found mainly in the east and south of Ireland. Erysimum Bowles’ Mauve (with my pumpkins in the background!). As the sun was setting I took some more pictures to compare to the morning ones from today. I love seeing how the light changes. I’m still seeking that perfect angle in the yard, too. Cherry trees in the morning. Cherry tree in the evening. Lucy keeping me company in the yard. What a lovely day it was. I even managed some time trimming the hedges. :-). For my American friends and family, I wish you a Happy Thanksgiving. Enjoy this very special holiday. 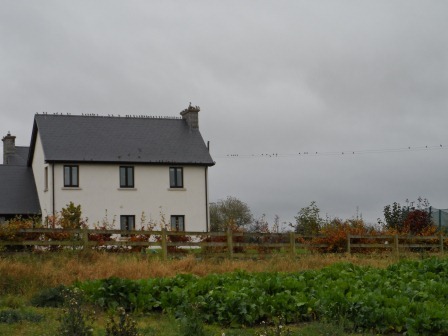 We are looking forward to celebrating on Sunday with another American family living in Ireland! For my non-American friends and family, Thank you for visiting! Small Goals for Big Jobs. Raking up some Cherry Tree leaves. This past weekend, my goal was to work on my center garden. It is a mess! I’ve been killing the grass with newspapers and cardboard since the summer time. 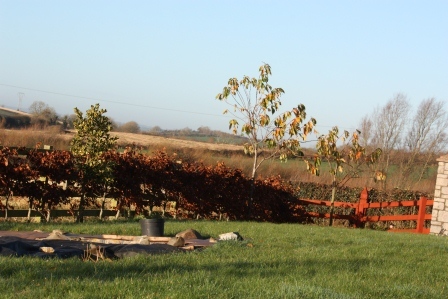 The center area has been cleared of grass and had manure added to it in September. But the outside edges had more sod added to them late in the summer. All of the sod hasn’t broken down yet, but I was able to work on one section by breaking up the soil with my hoe. My plan is to have three circles – but I don’t have the entire area marked out yet. The good, the bad, and the ugly… Center Garden as a work in progress. The center garden was originally going to be an all white garden. I planted a white lilac, a white tree peony, and a white Annabelle hydrangea. The Annabelle promptly died on me! 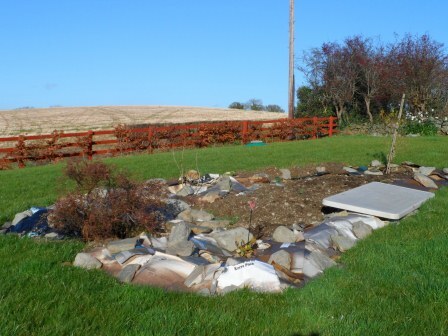 (I should have prepared the soil first – lesson learned!) The other two plants are thankfully doing well. The color scheme has already been altered, though. My father-in-law gave us two plants which were squished in his garden. 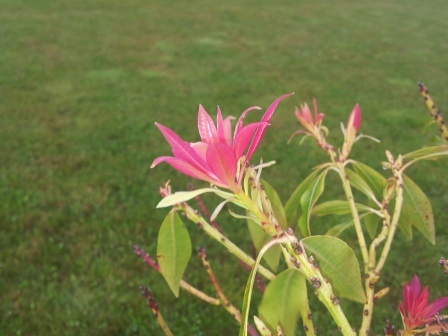 The first one is bush-like and has yellow flowers in the summer. I’m not really a fan of this one. I haven’t even learned it’s name, but it is acting as a wind barrier for my tree peony! 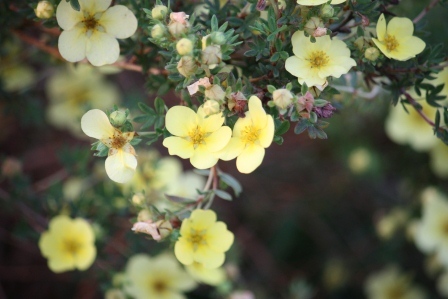 Father-in-law plant (Per Flower expert friend Susan: a Potentilla) … Yeah, ok, it looks pretty here – but look at the photo above: it is a mass of brown dead looking branches! The other Father-in-law plant, an evergreen called Pieris “Forest Flame”, I really like. 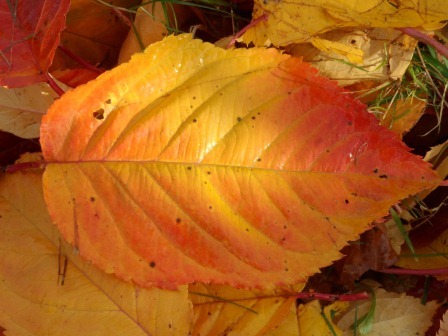 In the spring it’s new foliage is bright red, which gradually changes to pink, then cream, and ends in green. 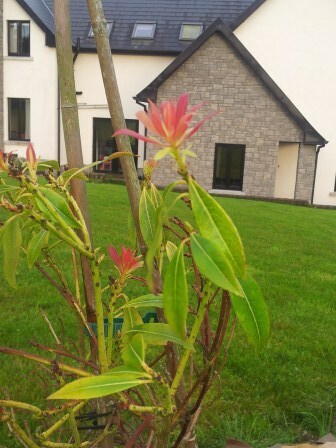 I had my doubts about the chances of its survival when we planted it, but despite it’s odd shape, it did have lovely red foliage last spring, and is showing signs of life! Forest Flame in the Spring. Forest Flame as a spring beauty. 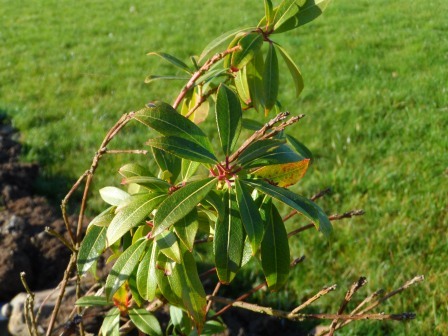 Forest Flame looking healthy in November ’12. I have a long list of flowers and plants I want in these three circles, so I really do need to finish the layout and get things going. Center Garden after I worked the soil in another section. I had a few more pieces of cardboard and some more newspapers, so I covered up another section. My goal is to have the three circles completed by the end of the winter. Back to being ugly again. Covering up with newspapers and cardboard. I managed to get some sunny photos of the center garden. But the sun was very hard to find earlier in the week. I have to say that I think my photos are very sad looking with a dark gray sky. But that’s all I have to show for my hard work! I’m going to start by showing you all of the cuttings from the beech hedges. (It’s a lot by the way!) I’ll save these cuttings, and then chip them up to add into my compost. That worked brilliantly this past summer. I’m usually short of brown material while I have so much grass to add in the summer months. 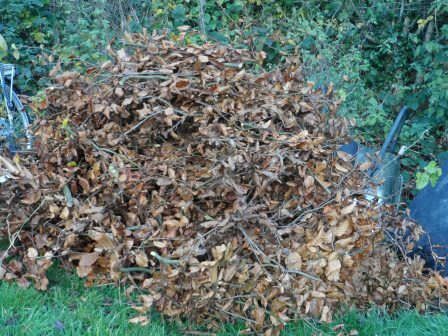 My pile of trimmings from the beech hedges. There was weeding underneath and cutting of the tops of the hedges this week. Do you see what I mean about the dark sky? This was at 2 in the afternoon! I’m keeping the hedges level with the fence. They still need to fill in quite a bit in sections. 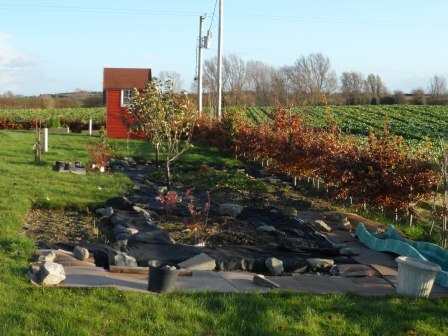 My plan this winter is to buy a few more hedge plants to fill in the big gaps. But otherwise I’m perfectly happy to wait and watch as they slowly develop and fill in. 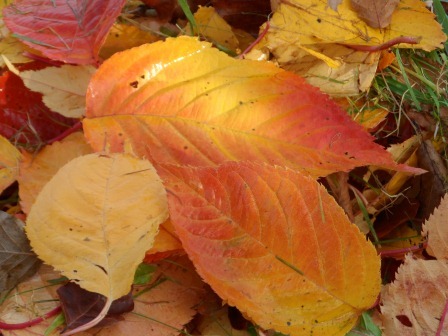 There are still a few more leaves left on the Cherry trees. I have to add one more picture. 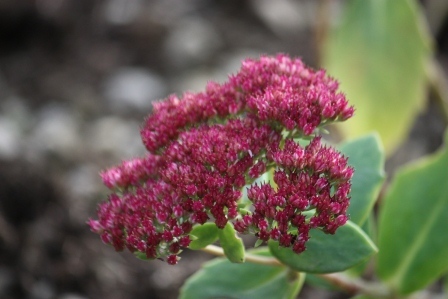 This is another gift plant from Susan: Sedum Autumn Joy. The color has been so pretty all fall. 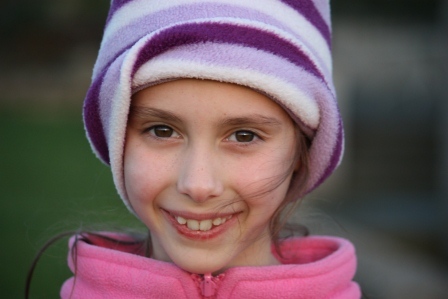 What are your goals this winter? Giving Thanks in November… and trimming Ivy! Thankful for my garden. It’s November look. 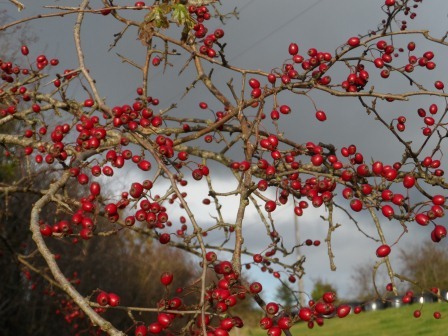 November is also a great time to cut down the ivy that is choking my Hawthorne trees! I have to say, though, that I think the ivy is rather pretty… just not on my trees. So I cut a small bunch and threw them in a vase. I think they bring a little life to my kitchen. The rest of the ivy that I cut down was thrown over the fence with all of my weeds. 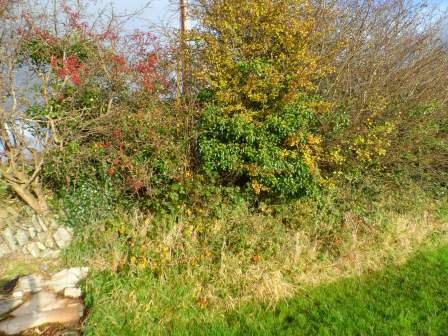 Ivy, brambles, nettles and weeds: you name it, my ditch wall is buried underneath it! I certainly won’t be short of work to do this winter. Ivy, brambles, nettles, and weeds covering my ditch wall (and Hawthorne trees). After I took the picture of the ivy I had brought inside, I realized I’d somewhat captured one of my favorite paintings. So I took another picture of just the painting! Here is my special painting story: I had it painted for me just before I moved from New York to Ireland. 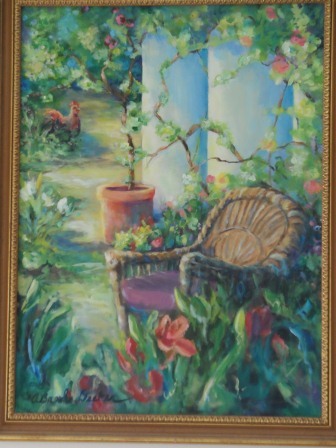 The artist, Audrey Decker, was in her 80s at the time. I’d seen some of her work 10 years earlier and I simply loved it. After reading an article in the newspaper about her I had cut it out and saved it for 10 years! Through some unusual circumstances I finally met her just months before my move, and she painted this painting for me. She is quite a special woman. I have the painting hanging in my favorite room in the house, my kitchen. Another thing to be thankful for! 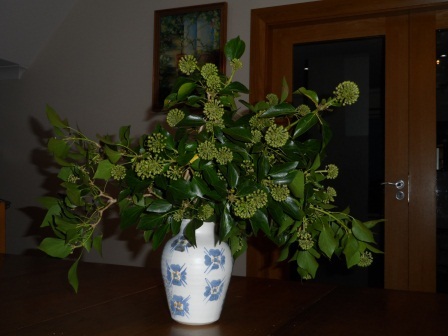 Bringing some life into the house: a vase of ivy. A special painting to me, by Audrey Decker. Back in the garden, I was able to capture my “Alaska” Shasta daisies on a sunny afternoon. Another happy flower. 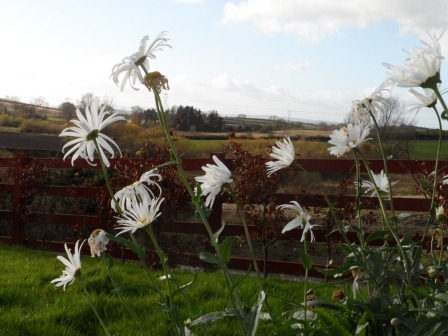 Shasta Daisy “Alaska” in November. 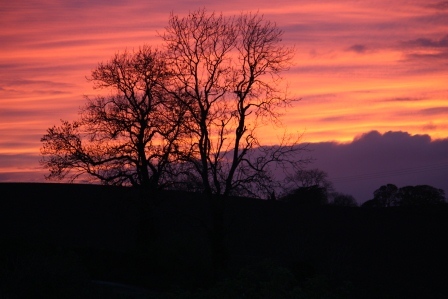 The sky was simply too beautiful to not photograph on this evening! My littlest one and I were captivated by the colors. Really, I have so much to be thankful for! A beautiful end to a lovely day. 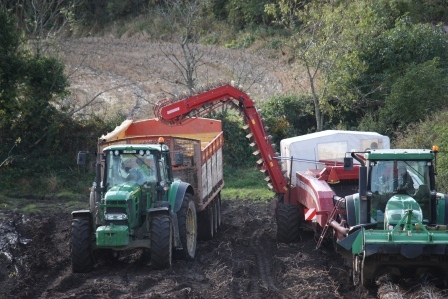 Pumpkin Soup & Potato Harvesting. Just to be absolutely clear, this picture is from my cook book! I know, it’s terrible that I couldn’t put together something so lovely myself. I’m lucky, and happy, that my soup isn’t splattered all over the bowl which I present to you as my soup! Hmm, I need to work a bit on my presentation… As I mentioned in my last post, I was on a mission to make some pumpkin soup. 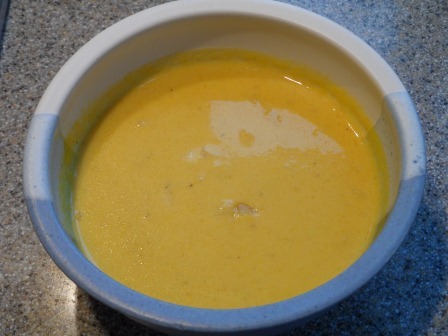 It’s probably the easiest soup to make, with very basic ingredients. 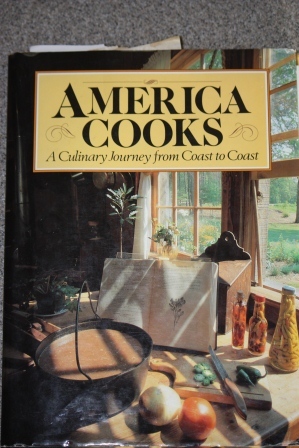 For me, it’s special to make because I use a cookbook which my mom gave to me years ago. I was living in Zurich at the time, and I think she just wanted to make sure I remembered my roots. It’s a beautiful book! Wash and peel the pumpkin, remove the seeds and cut the flesh into cubes with a sharp knife. Set aside. Melt the butter in a large pot and add the onion. Sweat the onion slowly until it is fairly tender. 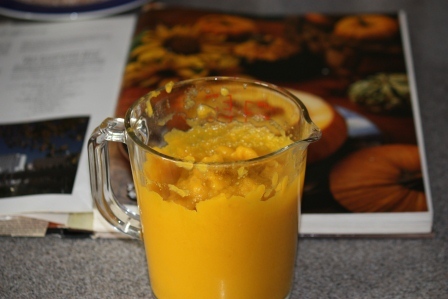 Add the pumpkin chunks and 1 quart of cold water. Season with salt and pepper and a pinch of nutmeg. Simmer for 20 minutes. Puree the pumpkin mixture in small batches, adding cream to each small batch. Return the soup to the rinsed out pot and reheat gently. Serve hot. From New England Culinary Institute, Montpelier, VT.
My pumpkins were more yellow than orange, but they tasted exactly like pumpkins should! 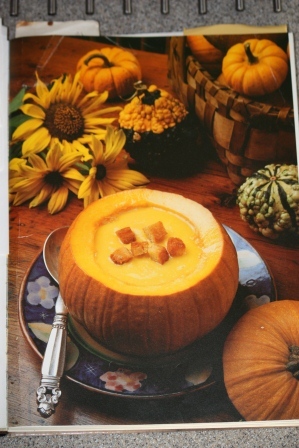 Pumpkin soup is a love it or hate it flavor. I love it, especially with cream. Oh! and I used my own onions! Of course I forgot to take a picture of them. 5 million pictures of pumpkins and none of onions … go figure. My marbled colored cooking pumpkins. That should really be the end of my pumpkin posts. (Should I promise that?) I have to add just a few more photos – not of pumpkins (phew, right?). The other day I was intrigued with the farmer harvesting his potatoes. What a production! I can just imagine what he thought of me hanging out of the upstairs bedroom window with my camera! Harvesting potatoes (two fields away from me). 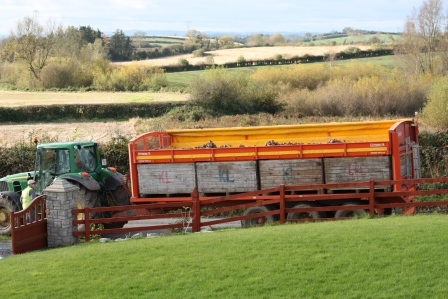 A truck load of spuds! 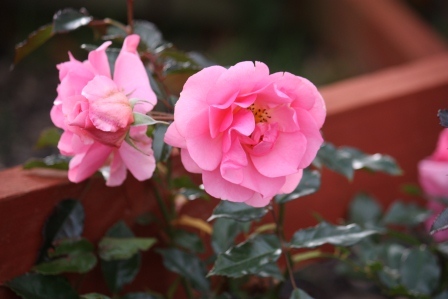 Zephirine Drouhin (1868) Roses at the front gate in November. November?! Really? I hope you won’t have forgotten me, as it’s been too long since I last posted! I’ve missed you. 🙂 Lately I’ve been wearing two of my many different hats; Mom of Swimmers hat, and Mom of Irish Dancers hat. We’ve all been working really hard! After two months into the full swimming schedule our girls improved all of their racing times at the first swim gala (meet) a couple of weeks ago. That’s a great way to start the season. Our three Irish dancers have been working since the summer towards the Ulster Championship Feis, which took place this past week in Donegal . It’s harder for the littlest one to keep that focus for so long, but she did well. (She’s finally making progress on keeping those feet turned out!) My kids also dance on teams, and it is just fantastic to watch as they keep their straight lines and perfect formations while dancing around the stage! We are so proud of them. They all danced their best, which is all we could ask for. It is rewarding to see the kids really putting their all into their activities and to watch them improve through their efforts. Sometimes it takes more work than other times, but thankfully we’re all going in the right direction! As for my Mom in the Garden hat, I too, have been putting in some “hard work”. It’s called weeding! The fence line is pretty much in constant need of clearing. I really like how it looks after I get a section finished. It’s nothing glamorous, not really even picture worthy, but if it isn’t maintained it sure is noticeable! If you know me, you know that I’d rather spend a week weeding than even think about using chemicals. I just think it is better for the environment and better for us. The hard work is worth it, and it is great being outside. Anyone curious about my pumpkins? I had very green pumpkins when I cut them off of their vines in early October. 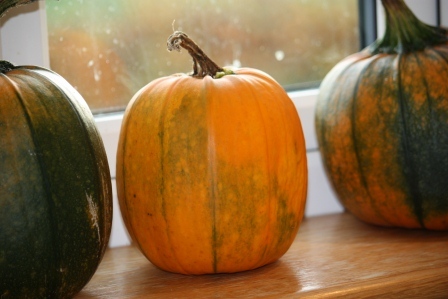 https://mominthegarden.wordpress.com/2012/10/09/the-race-is-on-green-or-orange-pumpkins-for-halloween/ I brought them inside, and placed them in sunny locations. I was completely skeptical that they’d ever turn orange, they were *really* green, but turn orange they did! Little by little, the jack-o-lantern pumpkins completely changed color. My cooking pumpkins were much slower to change, and have more of a marbled look. Doesn’t matter, I am looking forward to making some pumpkin soup! 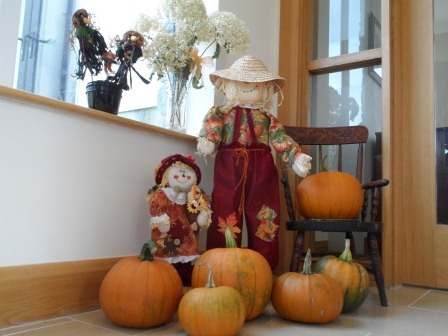 Pumpkin soup, and lovely orange pumpkins to decorate with. Yes, that will be perfect for Thanksgiving in a few weeks. No rushing into things for me!!! 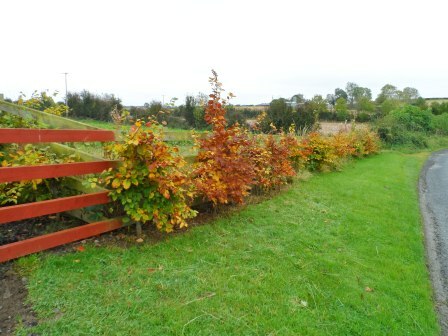 Beech hedging changing color in October. 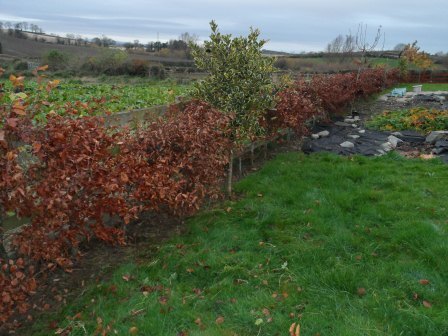 Weeding along the fence of beech hedging. A bird party on our house! A little distraction while I was weeding. 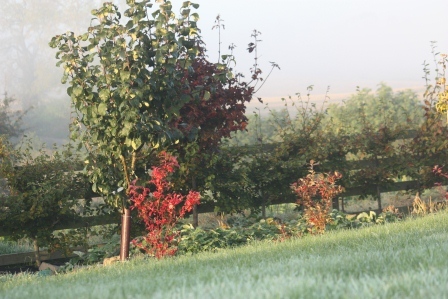 Early morning mist on the apple tree and blueberry bushes. My favorite fall picture (so far!). 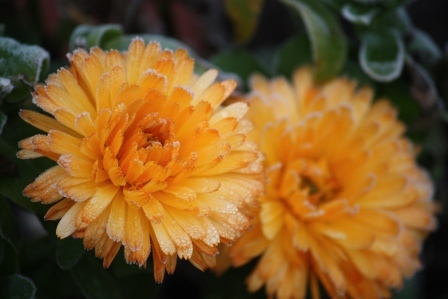 Calendula (apricot twist) still going strong! 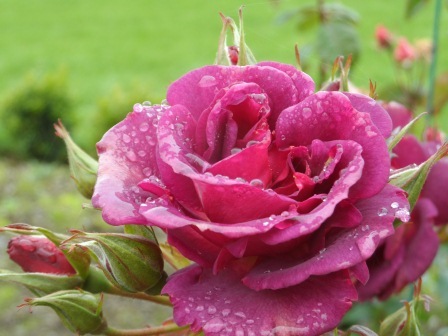 Burgundy Ice Floribunda Rose in October.